We've anticipated this day for several years - ever since we bought the familty farm back in 2010 - we've thought about having our first harvest from the test vineyard! 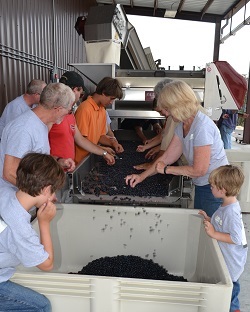 Well, today we gathered with some family and friends and harvested the first few varietals. 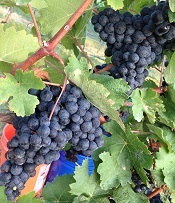 This includes the Tempranillo, Viognier and some of the Alicante Bouschet. 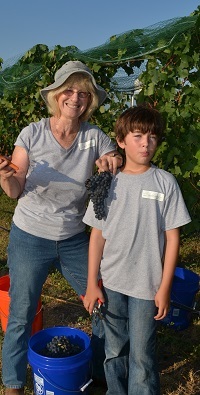 As we will do moving forward, this was a hand harvest where we take each cluster from the vines using hand shears. This provides a gentle handling of the fruit and also allows us to select only the best clusters and leave any damaged or otherwise less than pristine fruit. There was a big celebration from everyone as we met at the south end of the viognier row and had Reed and Diane, our vineyard manager and winegrower respectfully, take the first two clusters. Some of the clusters were Huge! Especially both the Tempranillo and the Alicante. We were very pleased with the amount of fruit harvested! In fact the clusters were larger than we anticipated, so our total weight was a fair bit more than predicted. The quality also could not be better! Once harvested we then took the fruit to be destemmed and then sorted to ensure only the best berries and no MOG (material other than grapes) made it into the fermenter. This is an intensively manual process as the team literally looks at every single grape to identify those flawed items and / or potentially foriegn objects and hand removes them. It is a lot of fun, and there is always good conversation to be had as your eyes and hands do the work, but leave your mind and mouth for friendly conversation. The fruit is all co-fermented. This simply means we are not separating the different grape types, but are putting them all in the same vessel for fermentation. This is a classic old-world approach to winemaking and it suits our needs very well with the existing vineyard. What will the sine be like when done? Stay tuned and be patient as it will be a few years before we know the real result of our labors!